Non-ferrous metals require a particular type of saw if a fast, precise and clean cut is needed. The T.C.T compound mitre saw from MACC has been built to suit this specificpurpose. As the sole Australian distributor of MACC T.C.T saws, you can trust us to supply you with this specialised piece of machinery wherever you are located in Australia. Our products can also be distributed to New Zealand, South East Asia and the South Pacific. We have two highly effective MACC T.C.T compound mitre saw models available stocked right here in Australia and ready to be delivered to you. With so many mitre saws out there in the market, the MACC T.C.T compound machines are up to the task of handling your precise cutting jobs with perfect precision. T.C.T stands for tungsten carbide-tipped. This refers to the type of blade used by this cutting saw. T.C.T blades are made from alloy steel with the tips of the teeth brazed with tungsten carbide inserts. These blades can operate at much higher temperatures than standard coldsaw blades, which means they can be run at much higher surface speeds to produce a faster cut while also maintaining an acceptable chip load per tooth. 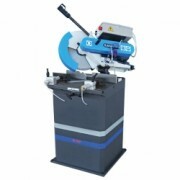 T.C.T saws are ideal for cutting non-ferrous metal including aluminium, copper, and brass. A T.C.T saw will give you better value for money as well as a faster, cleaner cut when working with these materials. T.C.T blades and saws hold a very long wear life and superior cutting performance, however, they are less resistant to shock. This is why MACC have manufactured T.C.T saws specifically to suit these blades that deliver reduced vibration during the cutting process. There’s no doubt that T.C.T saw blades are essential for cutting non-ferrous metal but why has this blade been paired with a compound mitre saw? Mitre saws are the best of the best when it comes to creating angled cuts thanks to the extremely high level of precision they provide. Essentially this is the best tool for making perfectly accurate crosscuts and mitre cuts with precise angles. A compound mitre saw also offers single and dual bevel options, giving you far greater angle variety and flexibility compared to a basic mitre saw model. A dual bevel option allows you to make left and right bevel cuts without having to move the workpiece to make the second cut. This saw is particularly effective if the pieces of metal you are working with are too cumbersome to move easily. The T.C.T compound mitre saw is also ideal if you need to make bevel cuts and you regularly need to complete fast and precise cuts for non-ferrous metals. If you need to meet these three requirements when looking for the next saw to invest in, the T.C.T compound mitre saw is a perfect choice. 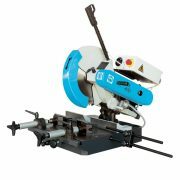 We have two extra heavy duty T.C.T saws in our range. The TA 400 is a standard 400mm T.C.T compound mitre saw featuring a swivel head, mitring head, twin manual sliding vices, fully recirculating coolant system and an easy-to-use trigger switch operation. The stand is optional on this machine. We also have the TA 400 Pneumatic model featuring additional benefits including two pneumatic spring return vices for automatic clamping once the trigger switch is pulled, pneumatically activated supply of fluid mist to the blade, the ability to automatically release the material upon the return of the cutting head and automated fluid mist de-activation. The stand is also included with this machine. With an Italian-made T.C.T metal cutting saw from MACC, every non-ferrous cutting saw job will be a breeze. If you are interested in purchasing MACC T.C.T saws in Australia, New Zealand, South Pacific and South East Asia, call us on (07) 3287 1114, email us at sales@industrialtool.com.au or send us an enquiry online to receive a quote.